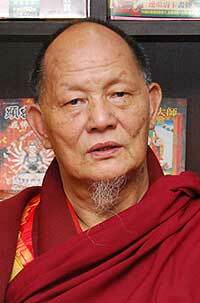 Khenpo Karpo Rinpoche was born in Zhongmey, Lhuntse District, in eastern Bhutan, on Guru Rinpoche Day, 10th May, 1934. Khenpo Karpo Rinpoche was trained by many eminent masters like Dudjom Rinpoche, Dilgo Khyentse Rinpoche and Dzogchen Polo Rinpoche. He attended Dudjom Rinpoche for almost 30 years from the age of 26 to 55 during which he received the complete Buddhist teachings covering empowerments, reading transmissions and instructions of the Nyingma Kama and Terma lineages. He completed the three-year retreat of the Outer Mahayoga, Inner Anuyoga, and the Secret Atiyoga of the Dzogchen tradition in Darjeeling in 1974 at the age of 40. Later, he undertook many meditative retreats in almost all of the scared places in Nepal and Bhutan. In order to fulfill the Buddha and many great Dzogchen masters and tertön’s prophesies as well as to benefit all sentient beings, Rinpoche deeply felt the need to build a giant Guru Rinpoche statue to bring peace and prosperity to the world. He started planning and proposed the project to the present King of Bhutan in the year of 2002. The King gave an explicit approval and showed his full support to such a magnanimous act undertaken for the public good. He passed away on February 19, 2017. This page was last edited on 15 December 2017, at 23:10.